What's in the bag? 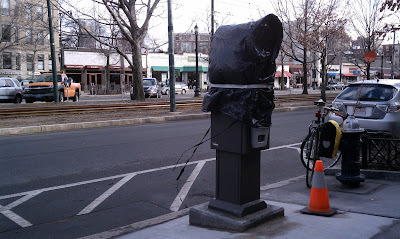 A parking meter that has been installed on Beacon Street near Audubon Circle/St. Mary's Place in Brookline. Perhaps more importantly, it's just a few blocks from Fenway. Attention-paying readers will recall that Brookline is instituting market-based meter rates on Red Sox game days as a way of ensuring that there is turnover of spaces during games. Space turnover means that businesses in the area, particularly restaurants, don't suffer because all on-street parking is consumed by game-goers. What does that have to do with this meter-in-a-bag? You can't do market-based rates with old meters. You've got to have new technology. Hence, the appearance of this meter -- and a bunch more on Beacon. They've been installed in time for opening day and the institution of the new game-day rate policy. Does it accept credit cards (or anything beyond quarters), or will that have to wait until 2100? Reasonably certain that it'll take bills and credit cards. Is my memory of the street wrong, or have they placed the meter in front of the cab stand? Im extremely glad to see theyve followed through with this. Most of the time, we get studies and no action. What are the rates/hours they decided on? And I hope Boston is paying attention, kenmore square needs these. A single one of these meters covers a zone of several spaces. I think this one is for the whole block. So, where it is specifically located doesn't make much difference. The location matters due to convenience. People WILL complain about being forced to "search for" the meter. But I looked at streetview and I was wrong, this meter is further up the block. I also looked at the city website and they have nothing on hours or rates on the new meters, although older news articles suggest $1 for hour one, $1 for hour 2 and $10 for hour 3. They will accept coin and credit only, no bills. The meters will accept coins, bills, credit cards, abd the Brooklinecard. Well, hows it been working out?